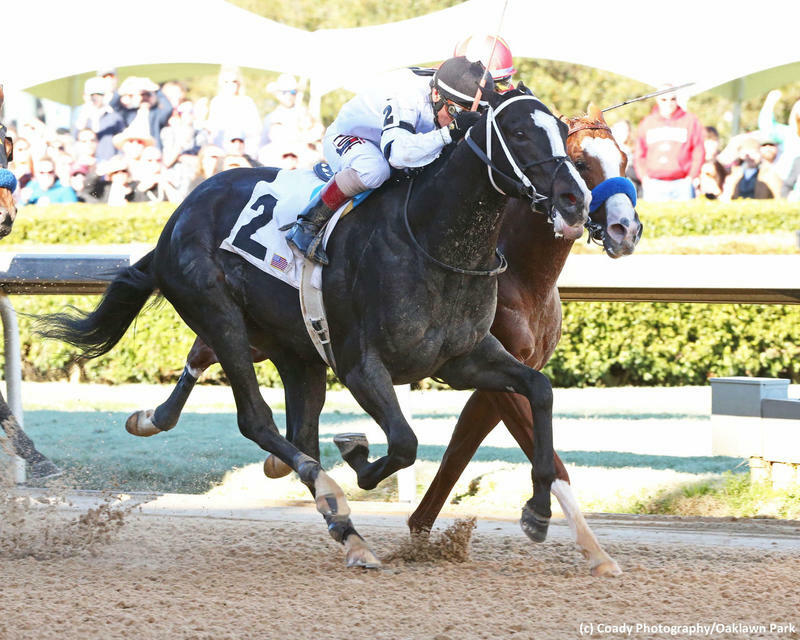 Long Range Toddy enhanced his Kentucky Derby status with a rallying victory in the first division of the $750,000 Rebel Stakes (G2) at Oaklawn Park, overhauling 2-5 favorite Improbable in the final strides for a neck win. Owned and bred by Willis Horton Racing, Long Range Toddy sprung an 8-1 upset with new rider Jon Court and Steve Asmussen trains the dark bay colt. Split into divisions, the 1 1/16-mile Rebel awarded points on a 37.5-15-7.5-3.75 basis as part of the Road to the Kentucky Derby series and Long Range Toddy jumped to third in the standings with a 53.5-point total. The Kentucky-bred picked up 10 points for an upset triumph in the Springboard Mile at Remington Park in mid-December and had placed in a pair of qualifiers at Oaklawn, finishing a neck second in the Smarty Jones prior to a troubled third in the February 18 Southwest (G3). With the $450,000 winner’s share, Long Range Toddy has now earned $851,125 from a 7-4-1-1 record. He broke his maiden the second time out at Remington in late September and captured the Clever Trevor in his third start. By Take Charge Indy, Long Range Toddy hails from the Unbridled’s Song mare Pleasant Song, who is out of multiple Grade 3-winning Storm Cat mare Pleasant Temper. Extra Hope showed speed from the inside and Classy John flashed forward from his outside post at the break, with Long Range Toddy involved in the early action as well after breaking alertly. Court took a hold of his mount and Long Range Toddy eased back as Classy John showed the way into the first turn and completed the opening quarter in :23.77. Improbable, who was exiting a convincing win in the Los Alamitos Futurity (G1) and unbeaten from three previous career starts, was caught about five wide from post 7 into the first turn and stalked a couple of lengths off the pace down the backstretch. Extra Hope advanced to take a short lead at the half-mile point and continued to lead through the far turn, reaching the three-quarters mark in 1:11.97. Long Range Toddy stalked a couple of lengths off the pace in fifth through most of the bend. Improbable launched a serious bid into the stretch, charging past Extra Hope to take a clear lead in upper stretch, and appeared extremely formidable with a sixteenth of a mile remaining, But Long Range Toddy found his best stride after straightening for home and came rolling through the latter stages to prove best in the shadow of the wire, stopping the teletimer in 1:42.49. Improbable finished 2 1/4 lengths clear of 7-2 second choice Galilean, who edged fourth-placer Extra Hope by a length. Easy Shot, Ninth Street and Classy John completed the order.